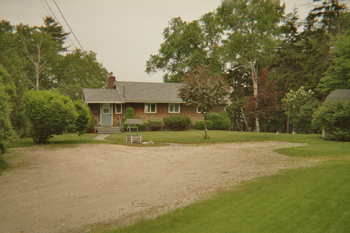 This waterfront lot was purchased with this house. 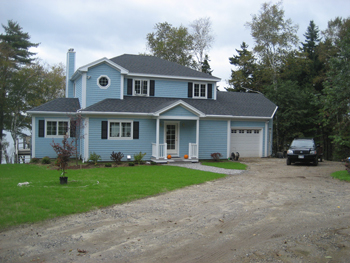 The floor plan of the existing home didn't suit the owners needs and was also in need of updating both inside and out. Insulation was inadequate, low ceiling height, and a cumbersome kitchen space were just some of the things needing to be changed. 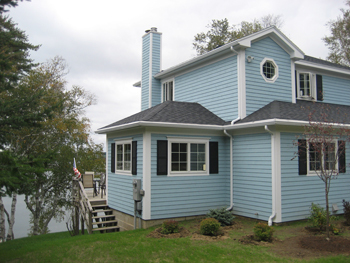 Wanting to utilize as much of their investment as possible the decision was made to raze the structure down to the first floor deck, expand along the front side of the house, and add a second story. 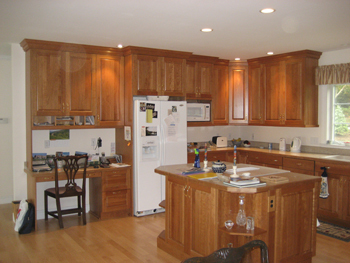 The result was this vastly different design which suited the homeowners needs much better. The owner was onsite communicating for much of the project and undertook the interior and exterior painting themselves. This view shows the underground electrical service, gutters running into drainage buried in the ground, and exterior chase containing the metalbestos chimney which services a new fireplace insert in the living room. 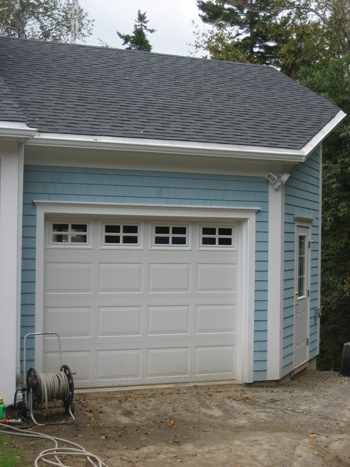 Due to the close proximity of the property line the garage addition had to be built with an angled corner to conform with code requirements. Not an ideal situation but an example of making a tough situation work. 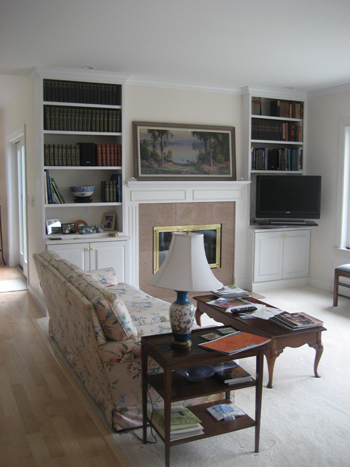 A dated brick hearth with an unsafe fireplace insert once occupied this space. After much brainstorming, planning, and communication with the homeowner, these custom "built in" shelves/cabinets and mantle were the result. 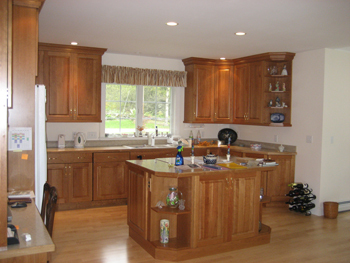 This professionally designed kitchen was constructed from stained maple and contains customized features such as a writing desk, moulding combinations, and an island. The kitchen from a different angle. Notice the cook top and stove in the island space freeing up counter space for food preparation.